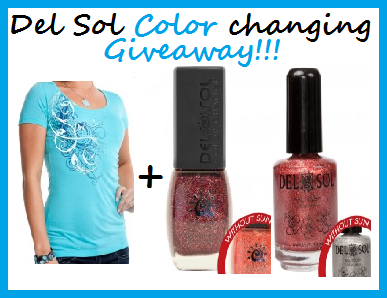 Color-changing Nail Polish by Del Sol is the wonder of the sun at your finger tips! Indoors, the nail polish is one fun color. But outside, Del Sol's exquisite, color change nail polish turns a dramatically different hue. From indoors to outside, and back to indoors, Del Sol Nail Polish gets attention as it changes. We (Happygreenbaby.com) love the many different color combinations to choose from plus seasonal colors throughout the year, and the fact that they are all toluene-free. Strike a different look just by stepping outside with color-change nail polish from Del Sol!